I started quilting my DQS 13 last night. Before I could start I always have to warm-up first. It helps me get the jitters and helps my hands and body remember what they are supposed to be doing. I always have a practice quilt sandwich lying around (about 18” x 18”) for warm-ups. I just reuse the same sandwich in different thread colors until it’s pretty stiff. Then I grab a new one. Those batting cut offs come in handy for practice sandwiches. This warm-up session was the area within the red pen. I was practicing a feather fill and I was glad I did. I made some mistakes, right above the “petit” on the top part of the feather. Those feathers look a little bit funny and flat. That’s because I wasn’t thinking and was trying to quilt that section from left to right instead of from right to left. Once I realized this I traveled to the correct starting point and as you can se the feathers over “esign co” looks so much better. It has been a while since I quilted on a DMS (domestic sewing machine) so the warm-up was needed to help my hands, arms, and body remember what to do. After this short warm up I started on the doll quilt. My only problem is that I kept forgetting to lower the presser bar after pivoting and rearranging the quilt sandwich. It’s nice that a long arm machine does that for you and you don’t have to think about it! 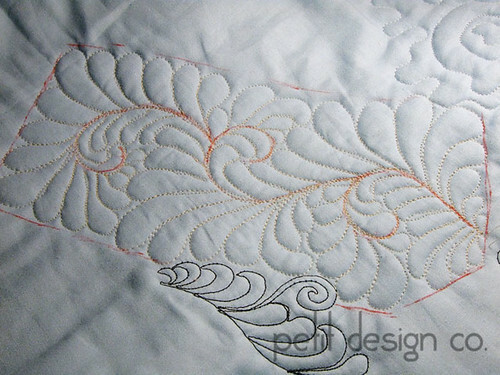 By the way, one of my favorite quilter’s and teachers has some awesome printouts on feathers on her blog. If you want to learn how to “feather” go visit Carla and make sure you take the time to leave her a nice thank you. Do you warm-up before quilting or just dive in?